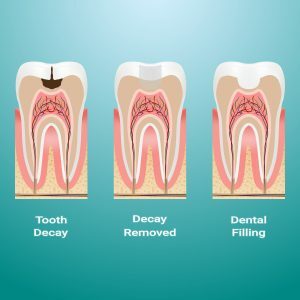 Dental fillings replace part of a tooth that has been lost because of decay or through accidental damage. Canberra Dental Care uses tooth coloured composite resin fillings in anterior (front) and posterior (back) teeth. Composite resin does have aesthetic and functional advantages over traditional amalgam fillings. They bond to the teeth for a better seal and teeth are less likely to fracture with non metal fillings. Unlike silver (amalgam) fillings, white filling material sticks to teeth and can form edges, so it may be effectively used to repair front teeth that are chipped, broken, decayed or worn. It can also be used to cover marks or discolouration that cleaning won’t remove. White fillings come in a range of shades so they can be matched to the colour of your own teeth. In a small number of cases we can still use amalgam fillings for molar and premolar fillings. This is usually the case where there is too much moisture or the amalgam best suits the restoration.